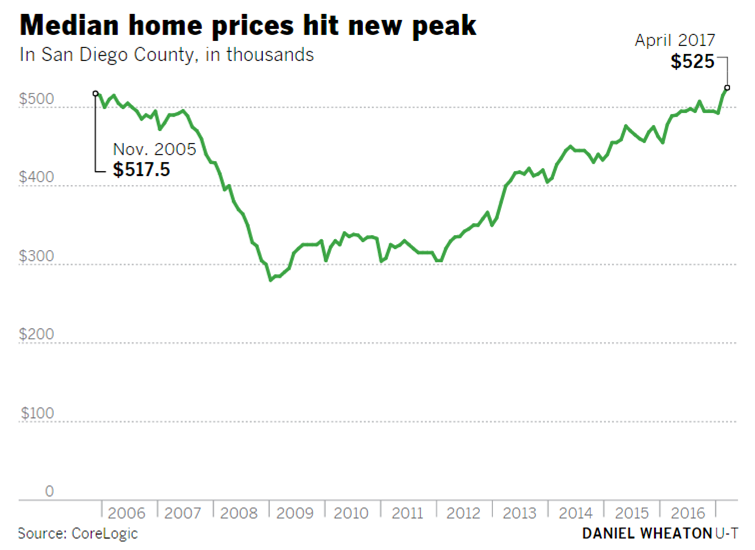 The San Diego County median home price hit $525,000 in April, passing the region’s previous peak reached in 2005. High demand and tight supply appear to have pushed the price beyond previous milestones. Supply is dwindling, too. In April, there were 4,763 active home listings in San Diego County. That is down from 5,754 listings the same time last year and the 6,386 in 2015. Housing bubble fears are likely with the new median but home prices would have to rise 40 percent (assuming no income or rent growth) to be as overvalued as much as they were during the last peak. Low interest rates are keeping the monthly mortgage rates somewhat affordable and home valuations high. As long as low rates persist, they could keep supporting the prices. The big question is if that will continue to happen and the smartest people in the world disagree on that. There were 4,369 active home listings in San Diego County in March, said the Greater San Diego Association of Realtors. That’s the fifth lowest month in its records going back to 2009, a far cry from the more than 13,000 listings in fall 2010. Also helping buyers are historically low interest rates and job growth, said Alan Gin, economist at University of San Diego. At the same time, he said buyers could be eager to get into the market before higher mortgage loan rates hit or just want to get out the rental game. “We’re getting to the point where the gap between rent and the average mortgage rate is narrowing,” Gin said. There are some signs that rent growth is slowing at the same time home prices are rising, possibly a sign that renters are becoming motivated to buy. From September to March, average rent increased just $5 to $1,748 a month. However, that is still an 8 percent rise over 12 months. In the grand scheme of things, a monthly mortgage rate isn’t that far off. Assuming a fixed rate mortgage, with 20 percent down, the monthly rate would be about $1,993 for a median priced home.